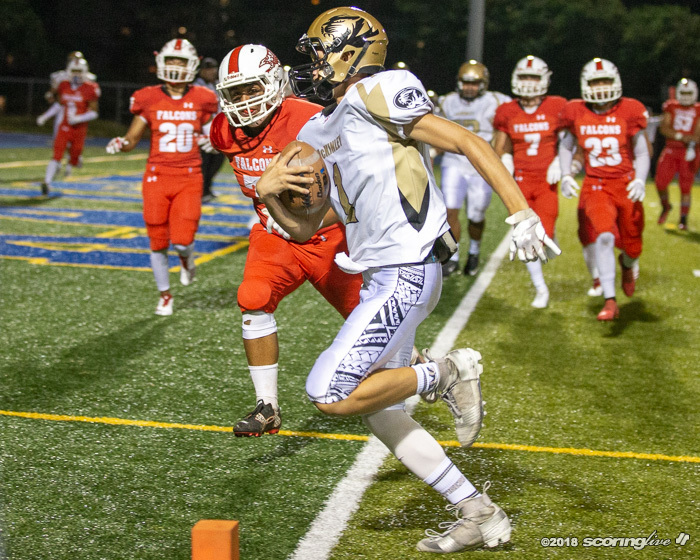 HAWAII KAI — Hard work paid off for the Kalani football team Friday night. 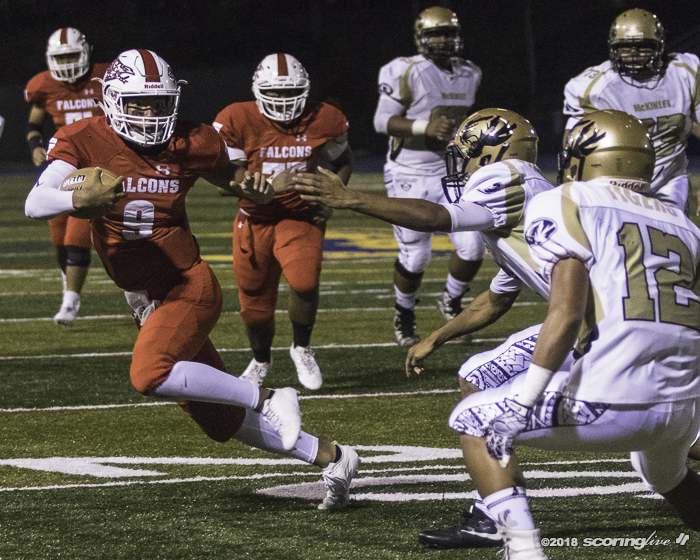 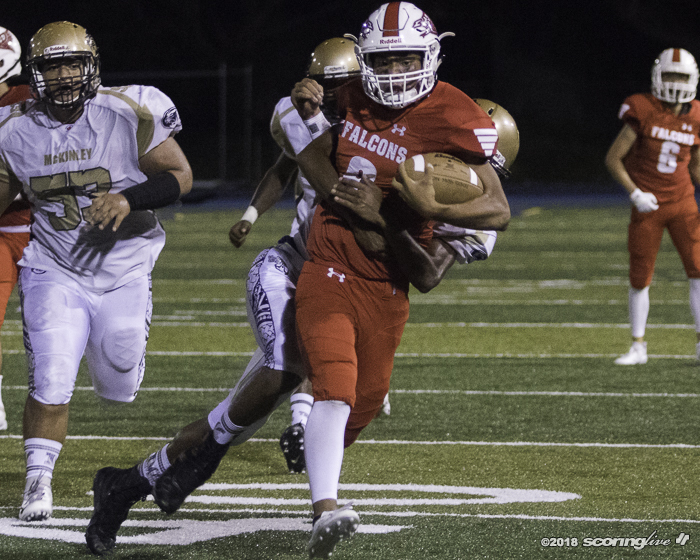 The Falcons put together their best game of the season on both sides of the ball to earn their first win of the year with a 22-16 homecoming victory over McKinley in an OIA Division II contest at Kaiser's Ted Fukushima Athletic Complex. 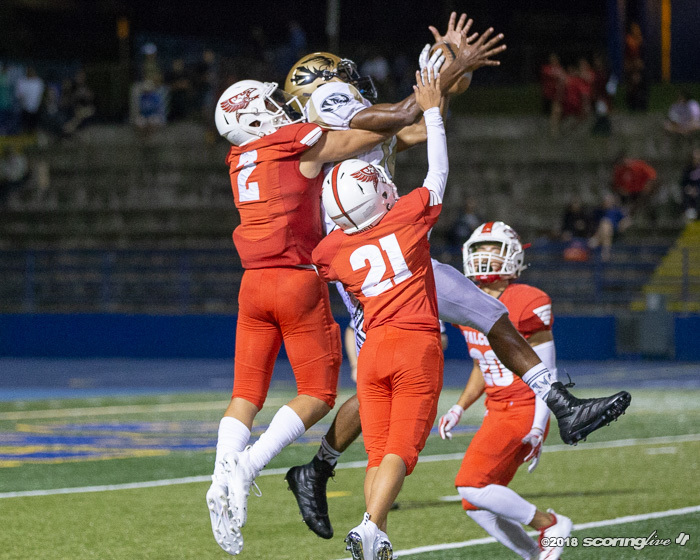 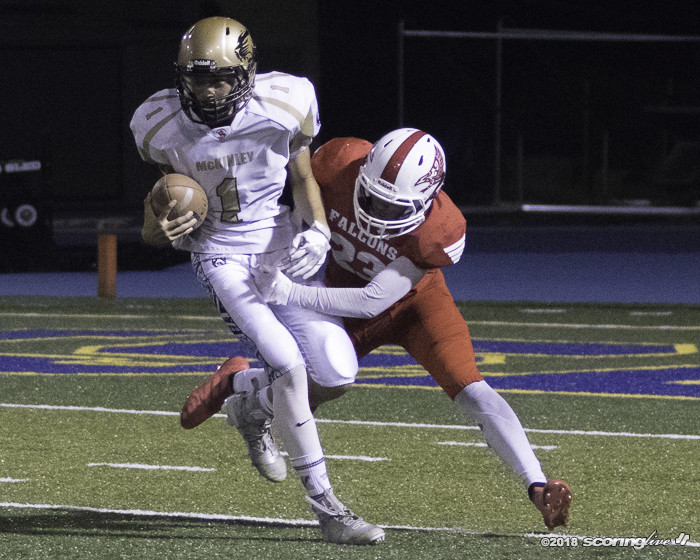 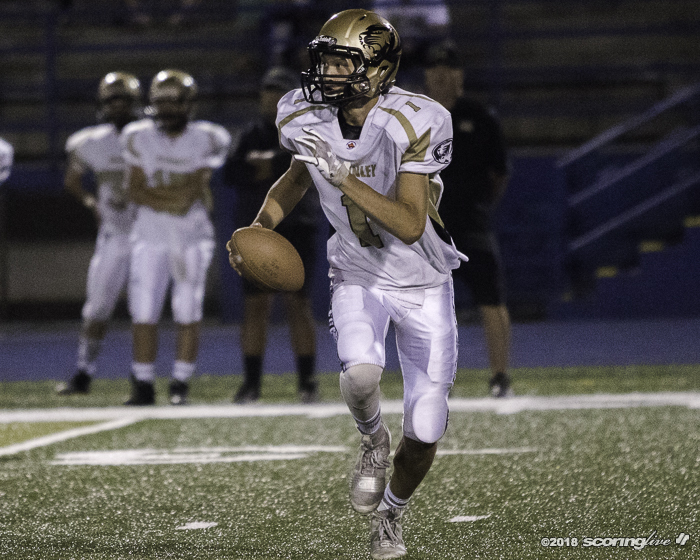 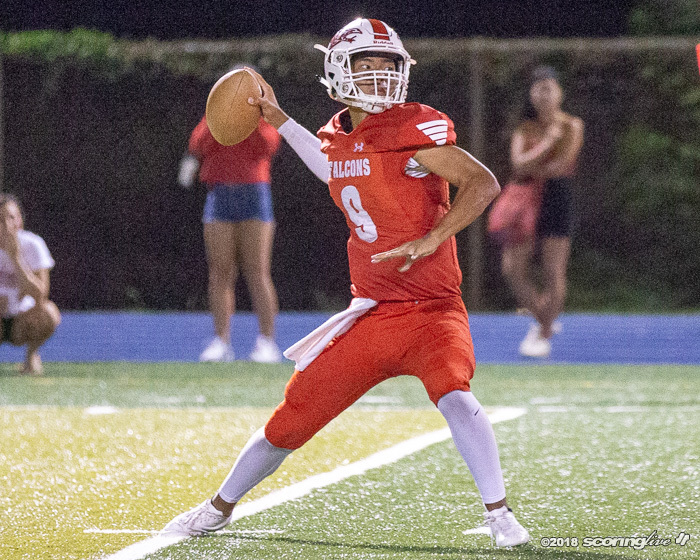 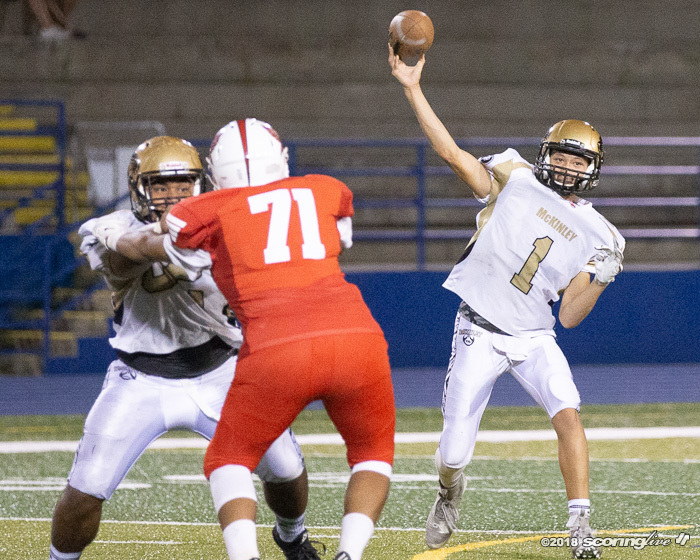 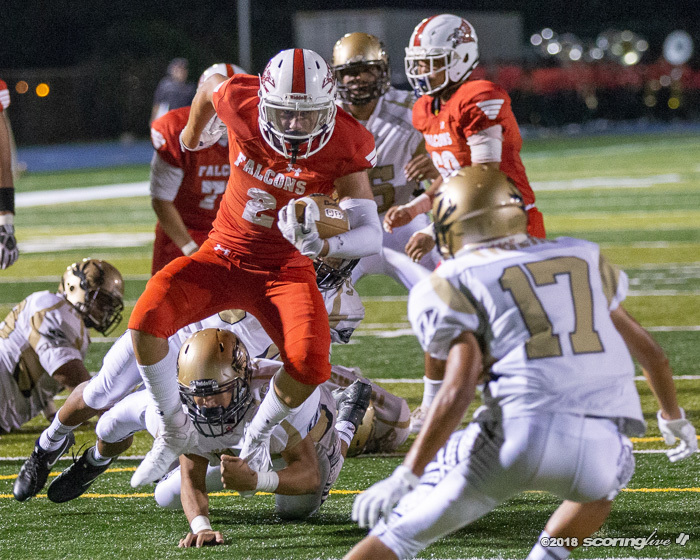 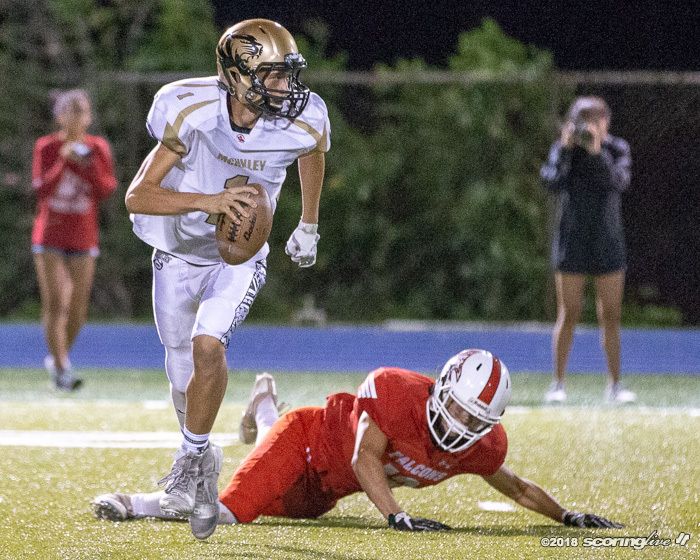 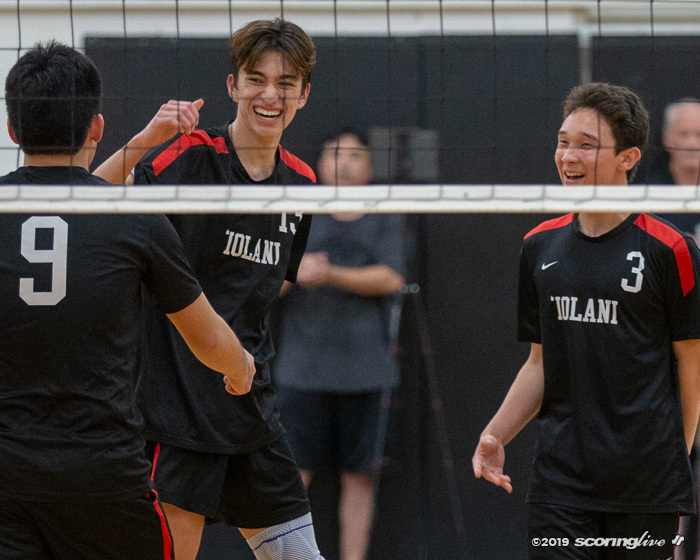 Junior quarterback Nicholas Sakamoto led the way with three touchdown passes to help Kalani improve to 1-5 overall and 1-3 in the league standings. 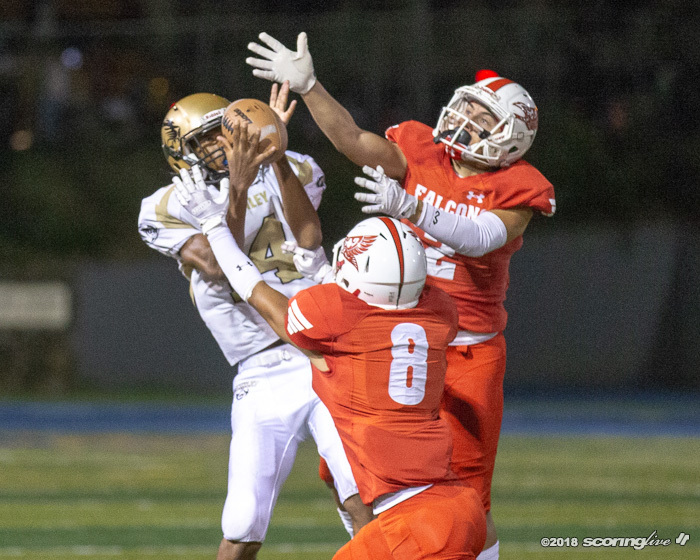 The Kalani defense also forced three turnovers and allowed a season-low in points to McKinley, who dropped to 1-5 and 0-4. 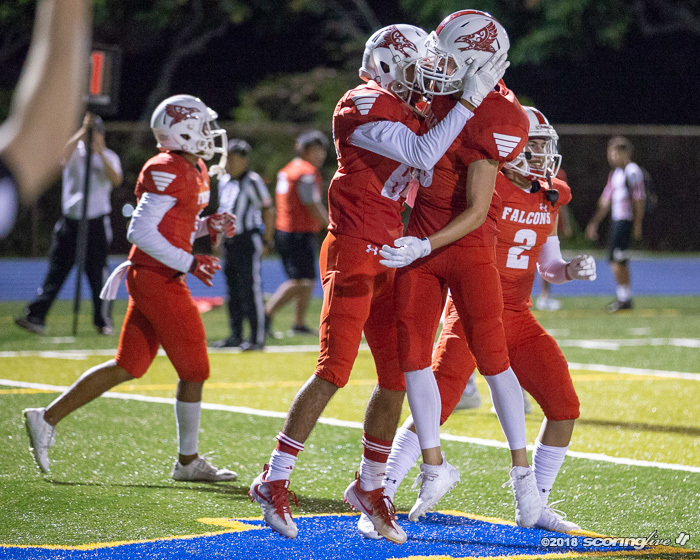 "It feels good to come out with a 'W' for the community after starting off 0-5," said senior defensive back Javan Montiho, who had an interception and broke up a pass. 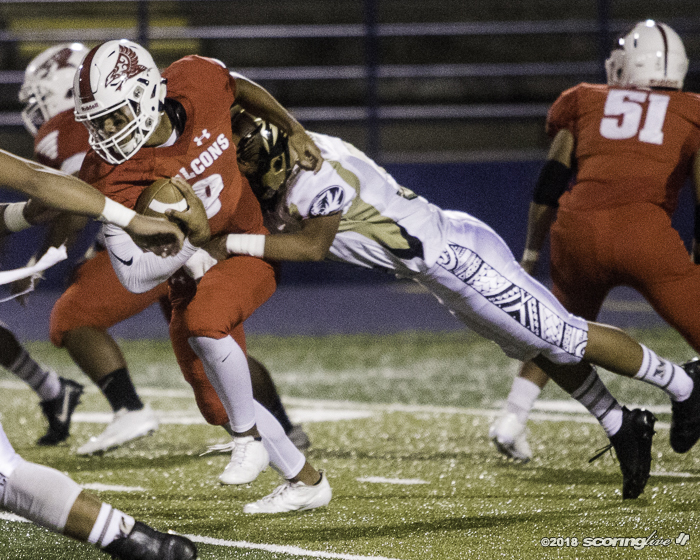 "We just want to finish the year strong." 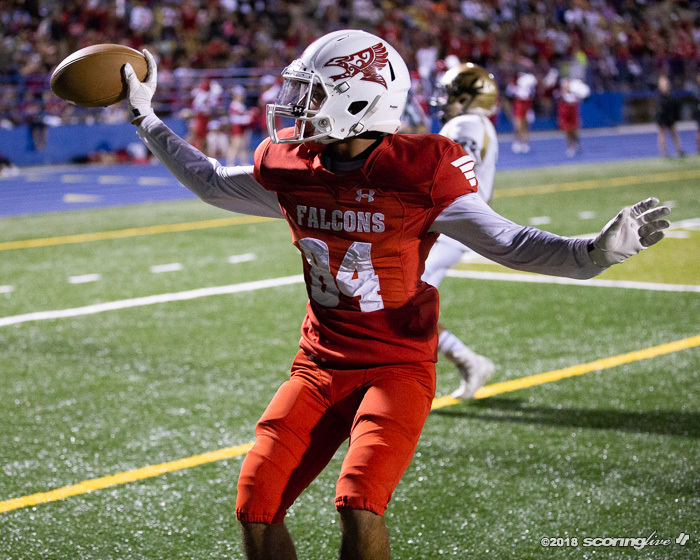 The Falcons also exploded for a season-high in points in the win after coming into the game with just eight points scored. 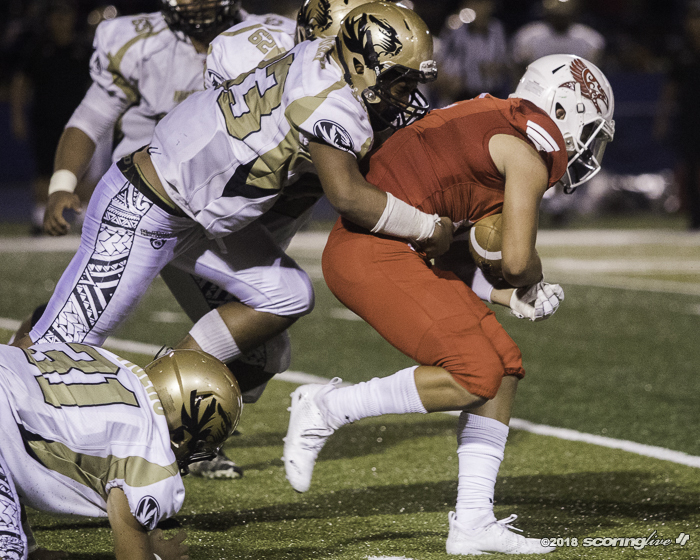 "We worked hard on executing this week," said Kalani coach Scott Melemai. 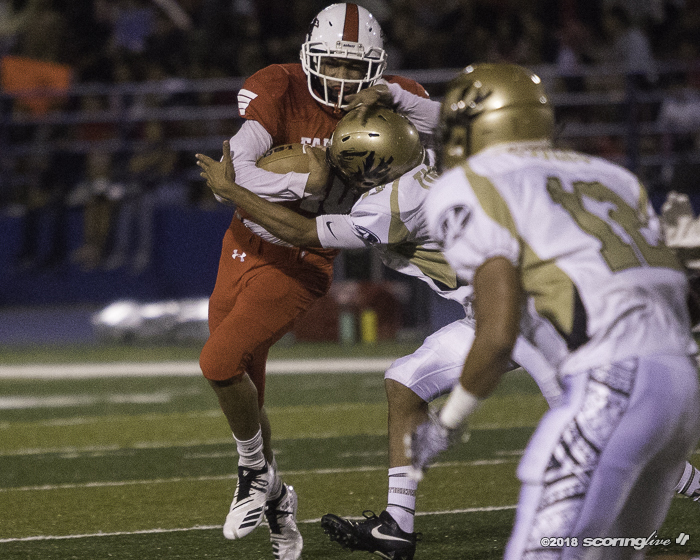 "I think our quarterback is getting better. 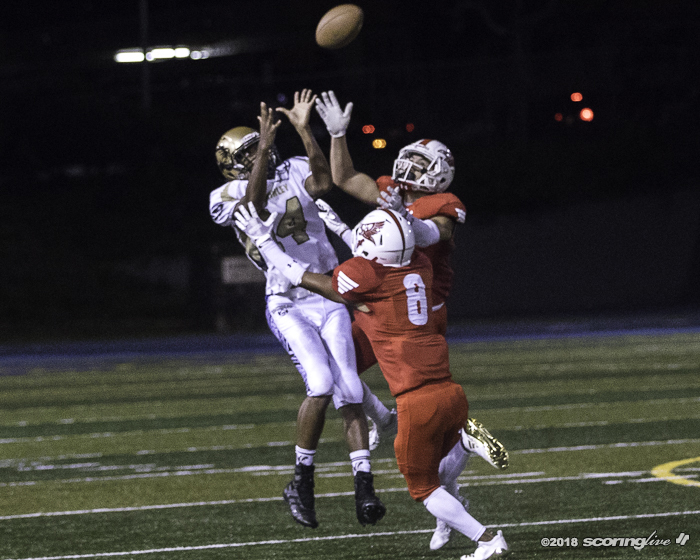 He's starting to see what's happening…and our receivers, I think we put in work. 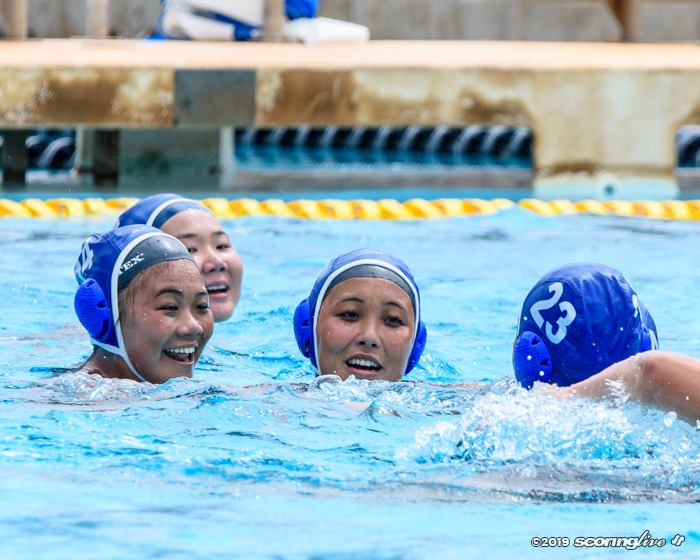 They were more focused. 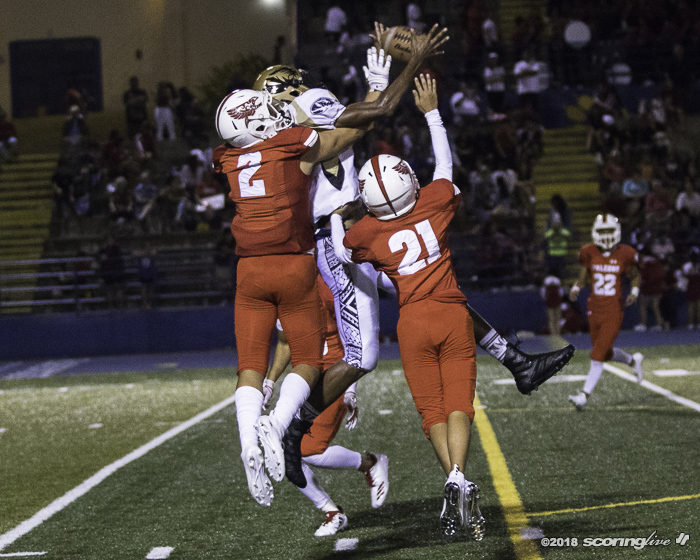 They just needed more time." 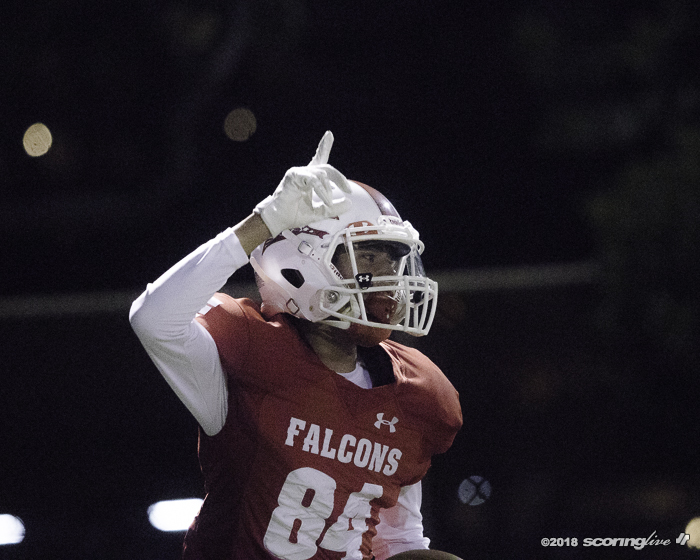 Sakamoto, who entered the game with just one TD pass and 12 interceptions to his name, said a change in work ethic helped the Falcons get back on the right track. 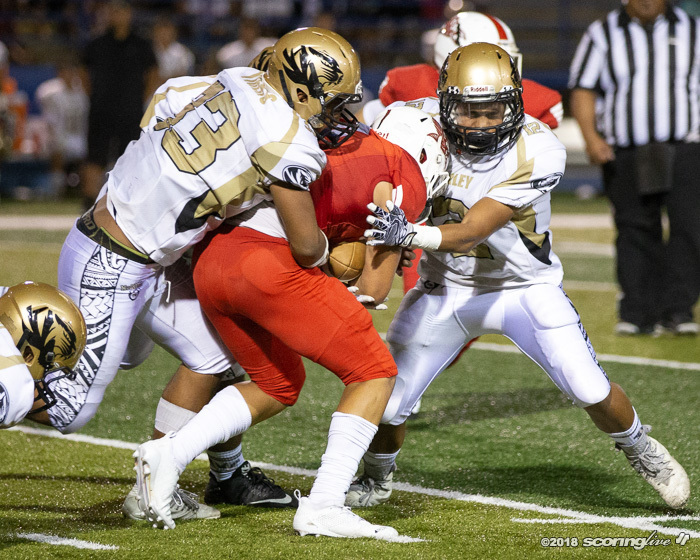 "We just had a change of attitude in the whole team," he said. 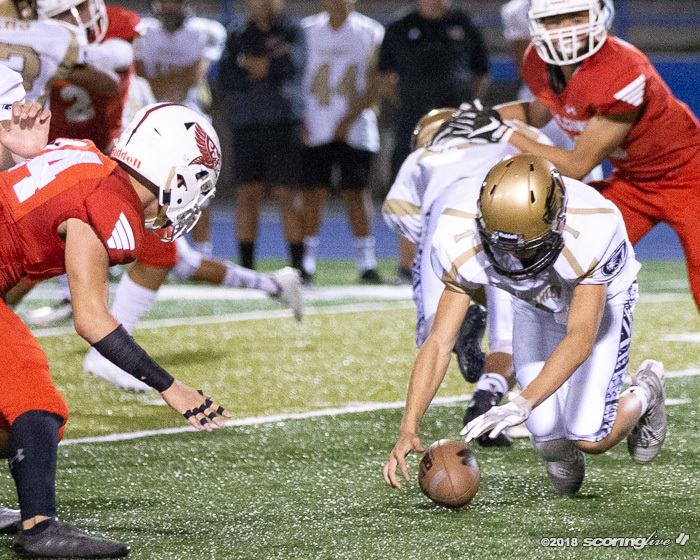 "We were tired of losing and we changed that all in practice and worked hard." 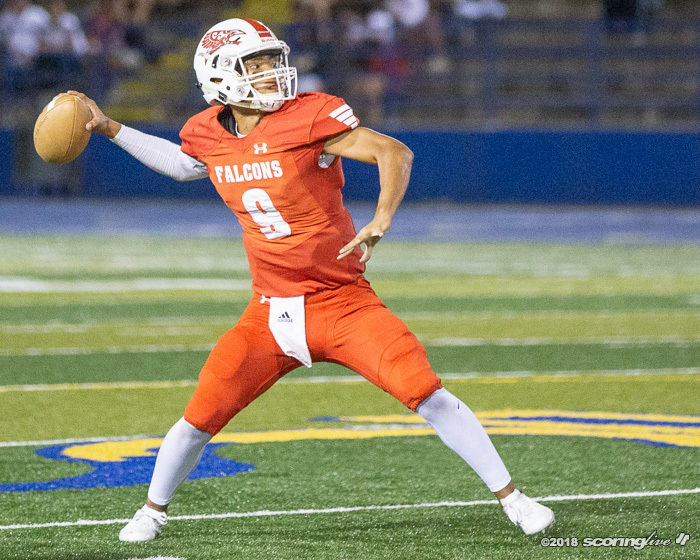 In return the junior QB had his best game of the year, completing 15 of 26 passes for 161 yards and three TDs while adding a game-high 57 yards on the ground. 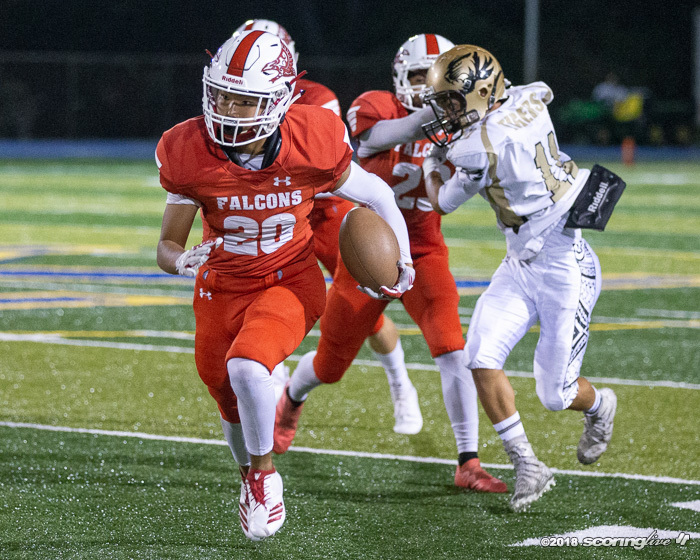 Noah Ah Sam caught two scoring passes from Sakamoto to bookend the Falcons' scoring and Jerick Robinson was a good safety valve with a six receptions for 57 yards and another score. 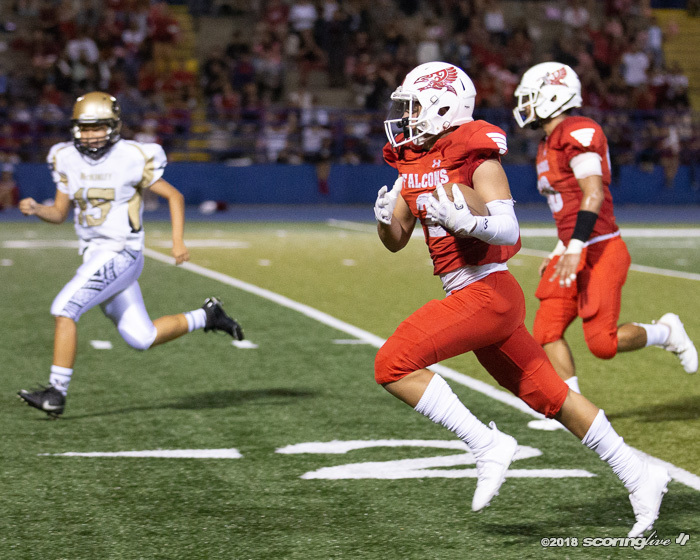 The team also banded together midway through the first quarter when starting running back Jake Lee suffered a gruesome injury that required an ambulance. 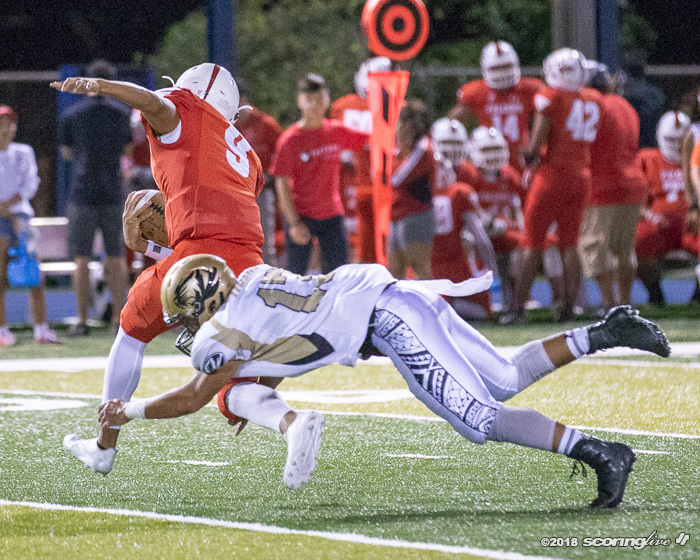 "I think it woke us up," Melemai said of Lee's injury. 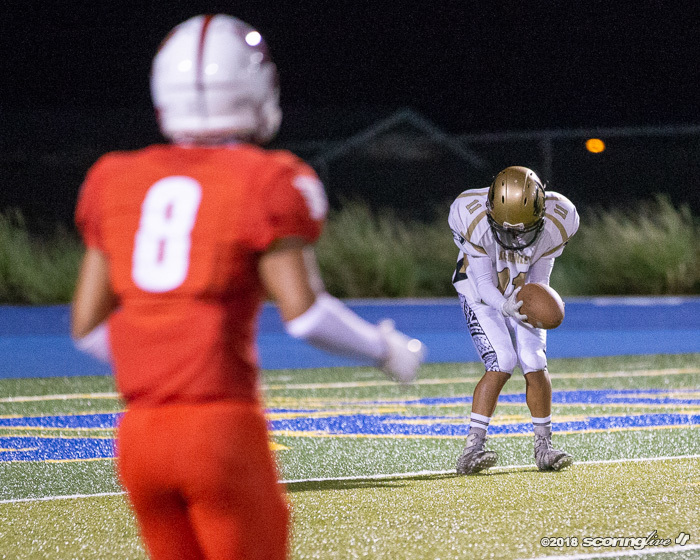 "It's sad to see him go down. 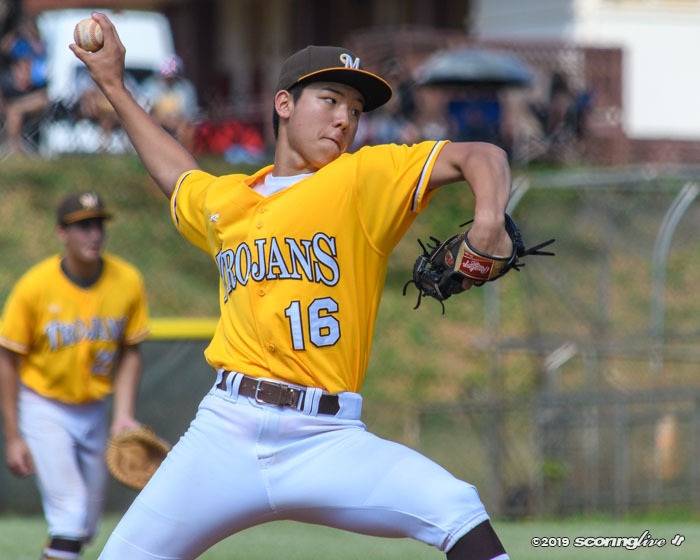 I hope the best health for him. 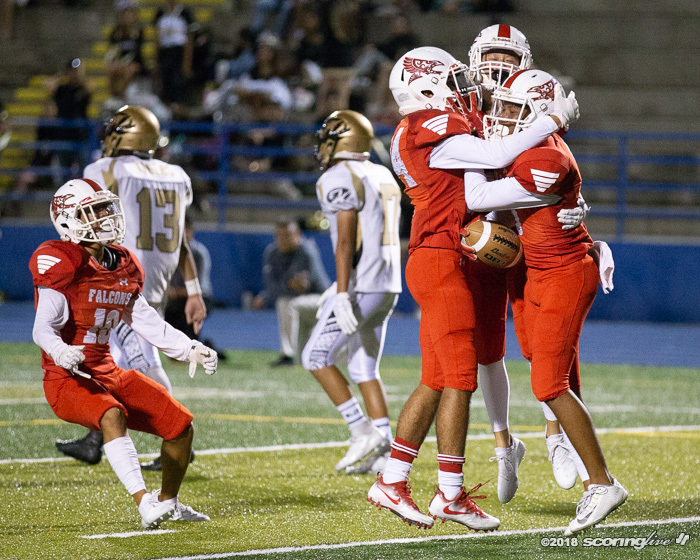 The team, we always talk about family. 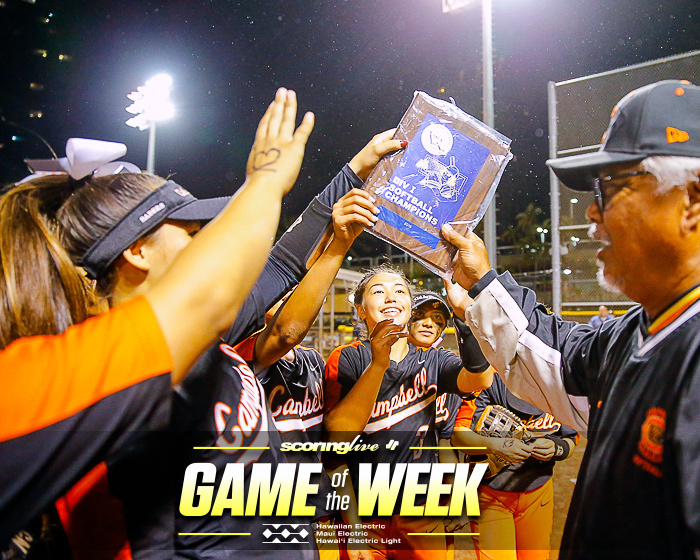 I think that was something that helped them see the severity of the game and the urgency that they need." 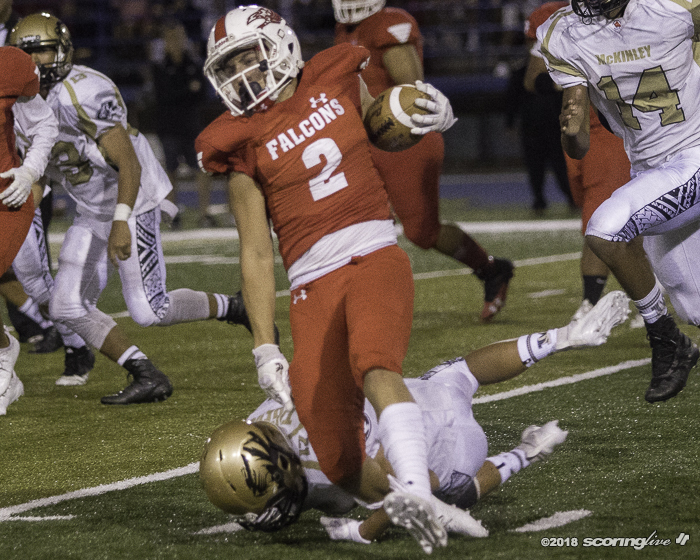 McKinley scored the first points of the contest after its defense forced the Falcons into a punting situation from their own 1-yard line. 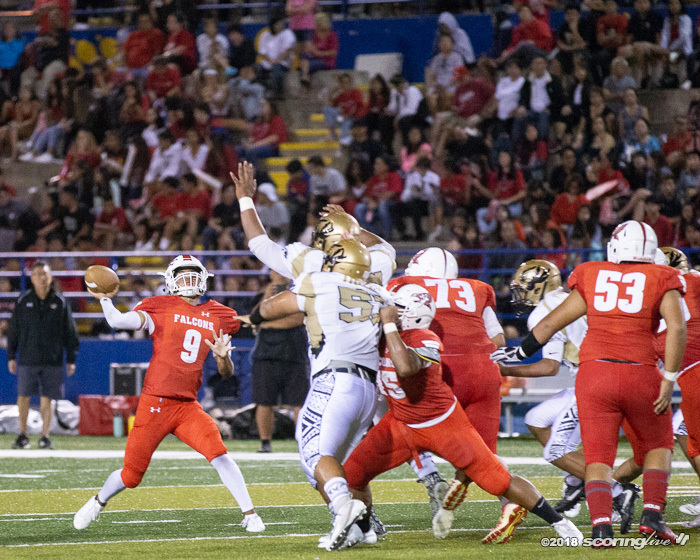 The Tigers started their first drive of the game on Kalani's 26-yard line and went six plays before Jayden Victorino-Jay ran in a 1-yard TD. 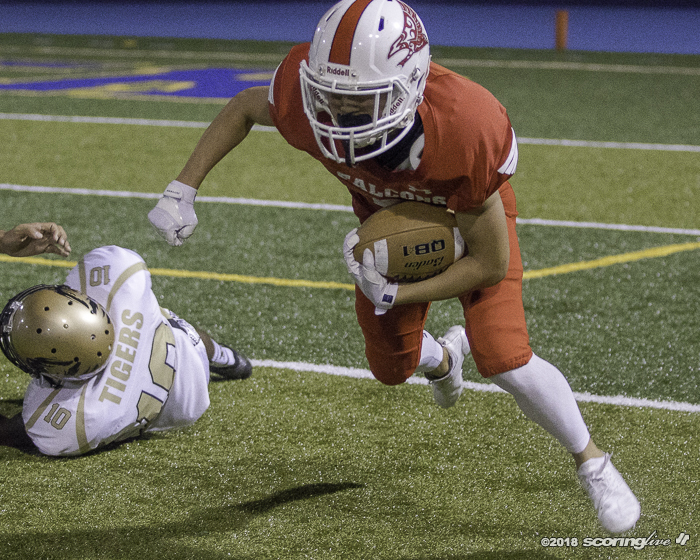 Victorino-Jay also ran in the 2-point conversion to give the Tigers a 8-0 lead with 7:54 to play in the first quarter. 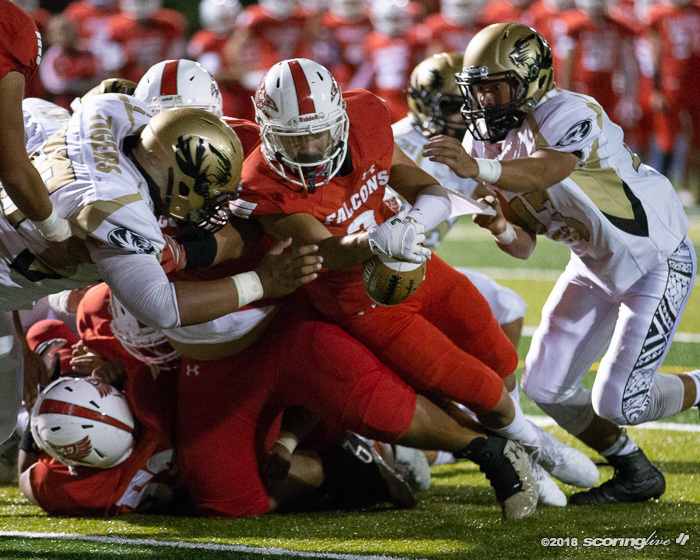 Kalani's first scoring drive came after Rimington Hew recovered a bad McKinley snap inside the Tigers' 20-yard line. 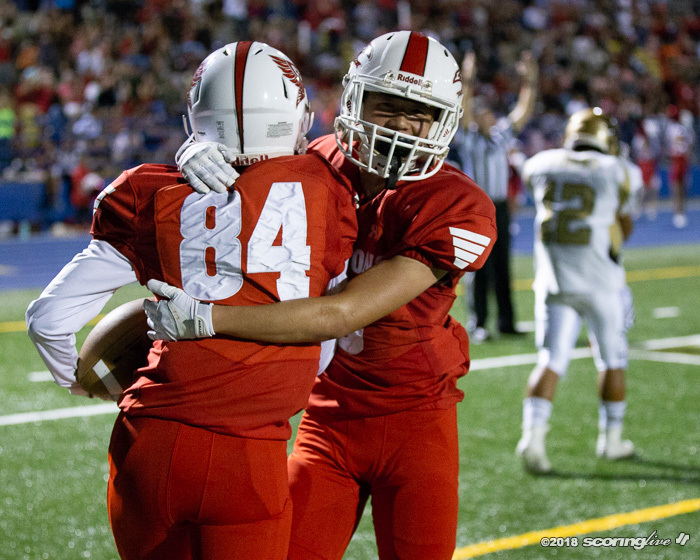 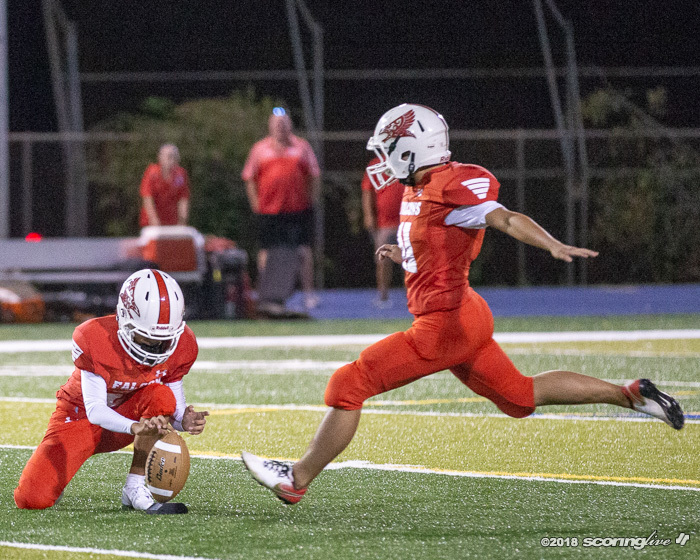 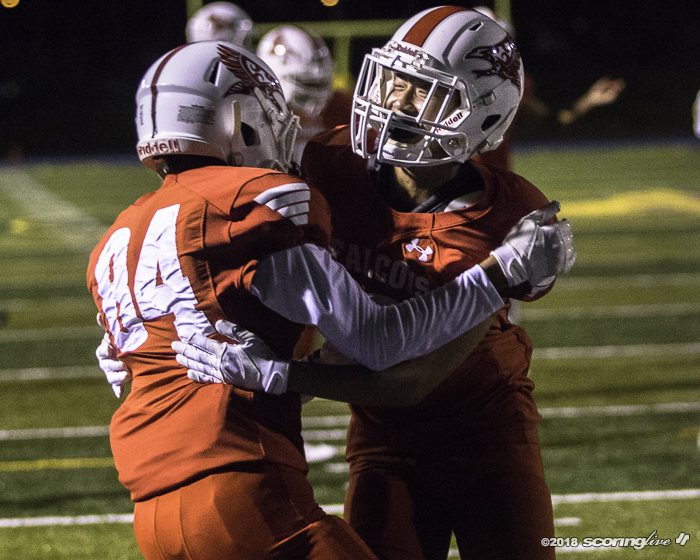 The Falcons ultimately had to settle for a 47-yard field goal attempt by Kai Sigler that went wide left, but a roughing the kicker penalty against McKinley gave Kalani new life. 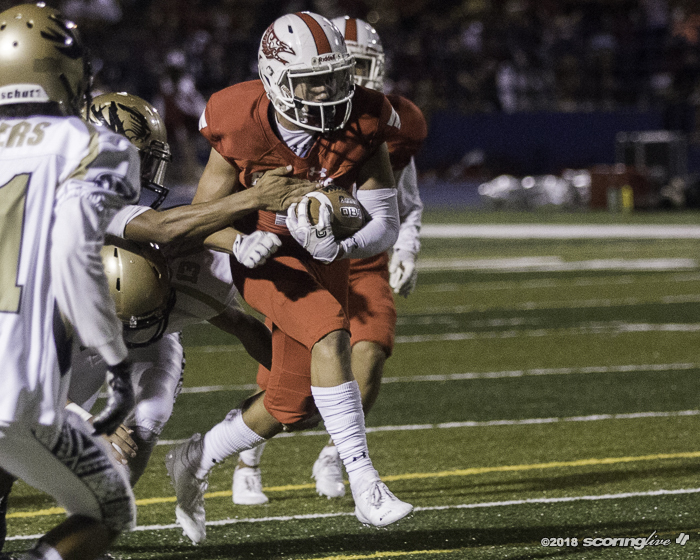 Five plays later Sakamoto found Ah Sam near the right side of the end zone for a 6-yard score to make it a 8-6 game with 6:33 to go in the second period. 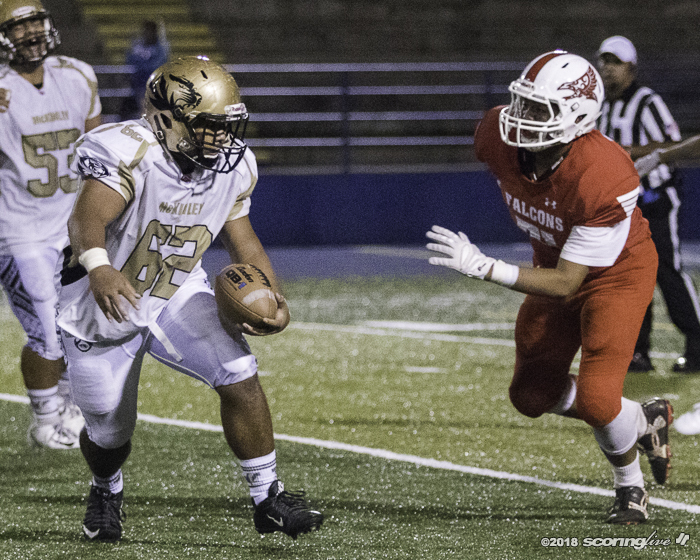 Momentum began to swung into the Falcons' favor after the score as the defense forced McKinley into a three-and-out on the ensuing possession. 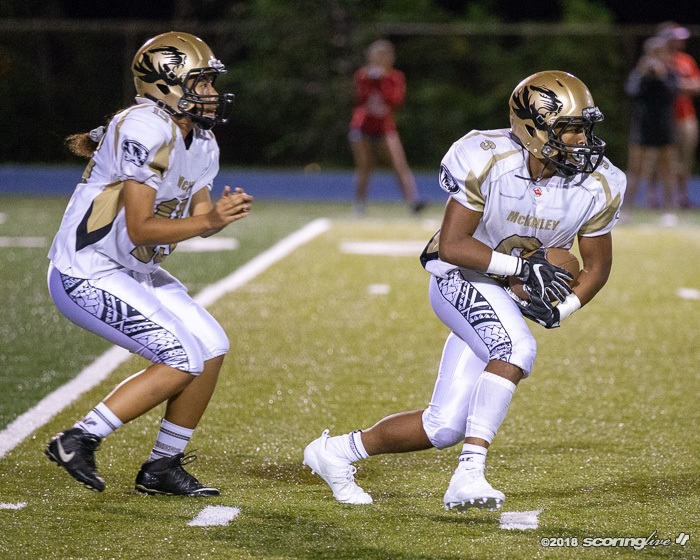 The Tigers' punt attempt also bounced backwards for negative yardage to put Kalani at the McKinley 28. 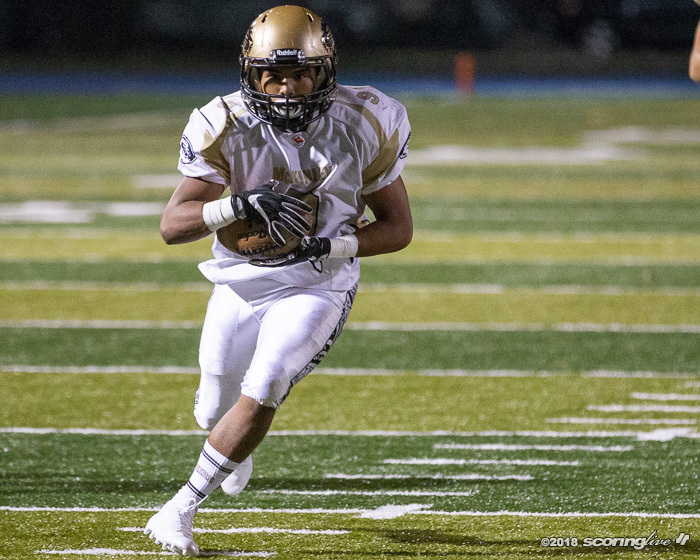 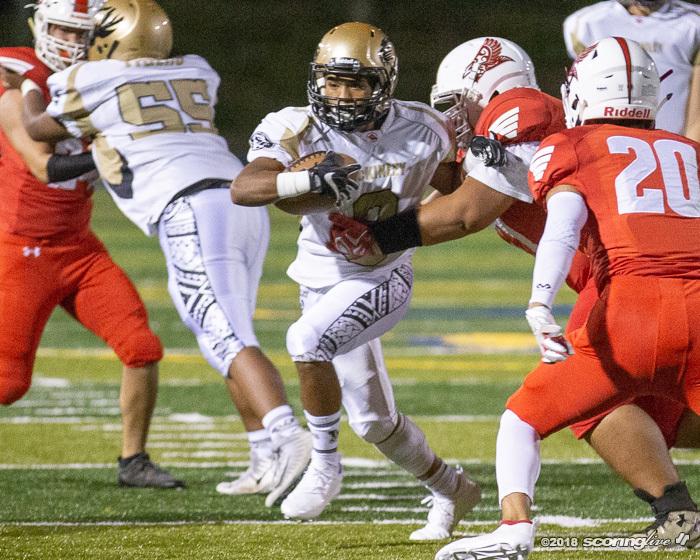 Two plays later Sakamoto found Robinson in the left seam for a 24-yard score. 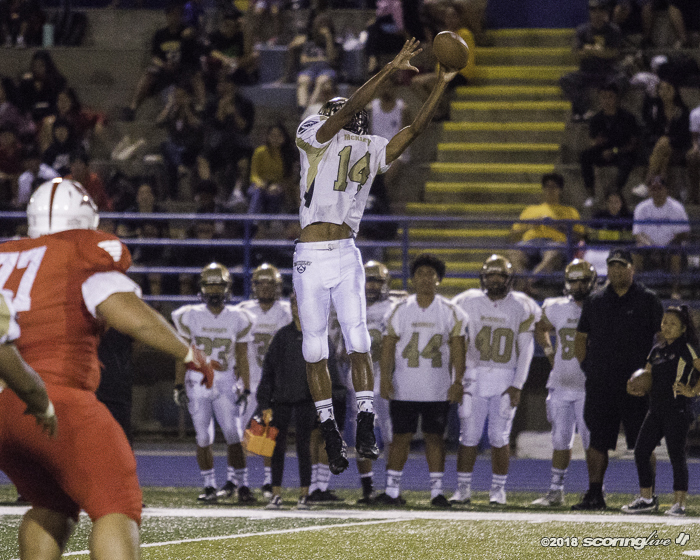 Kevin Tabuchi tacked on the PAT to give Kalani its first lead of the season, 13-8. 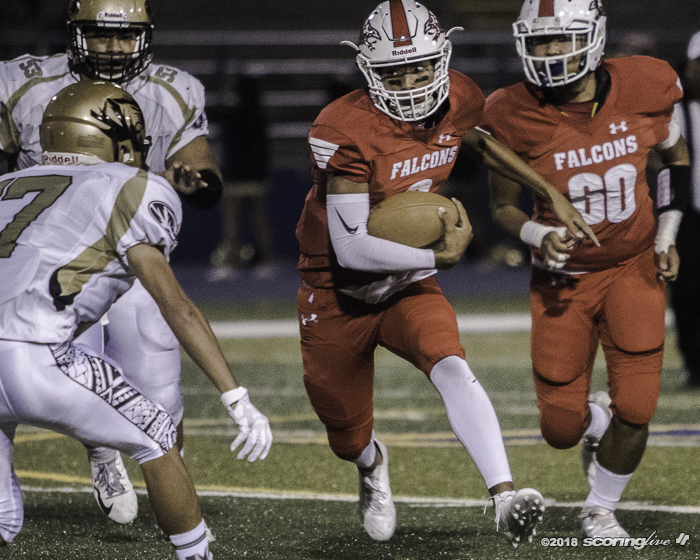 An interception by Rayce Aaron Manriki with under two minutes to play set up the Falcons' final score of the first half. 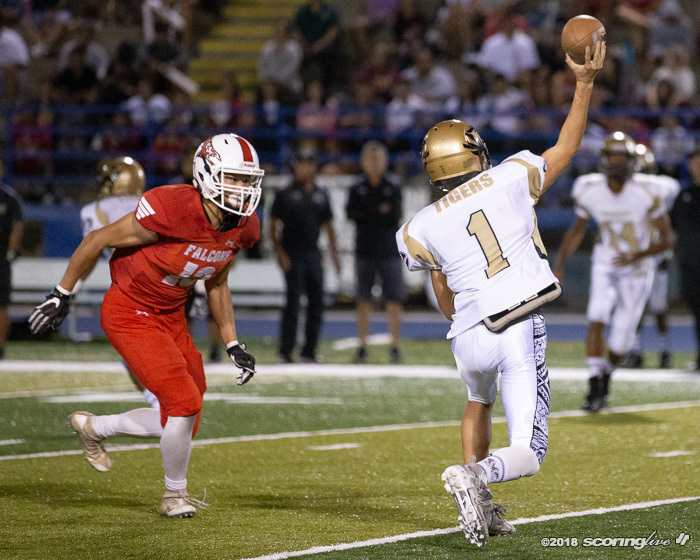 Kalani used its final timeout of the half with 24.6 remaining and managed to line up for a 33-yard field goal by Sigler despite Sakamoto taking a sack after the timeout. 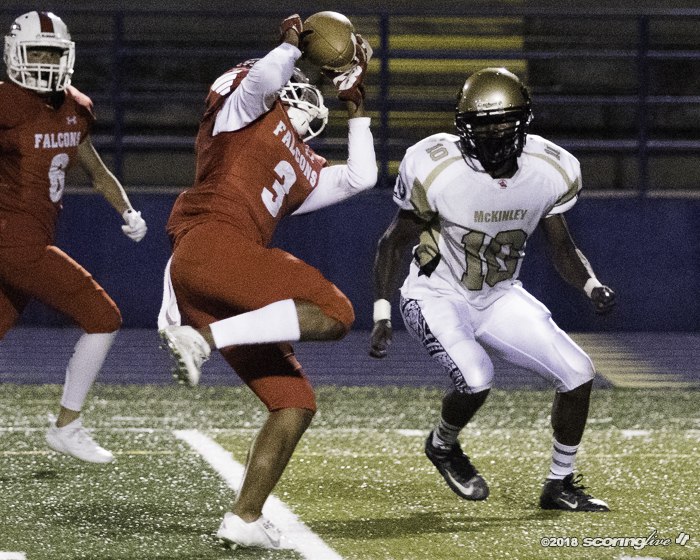 This gave the Falcons a 16-8 lead at the break. 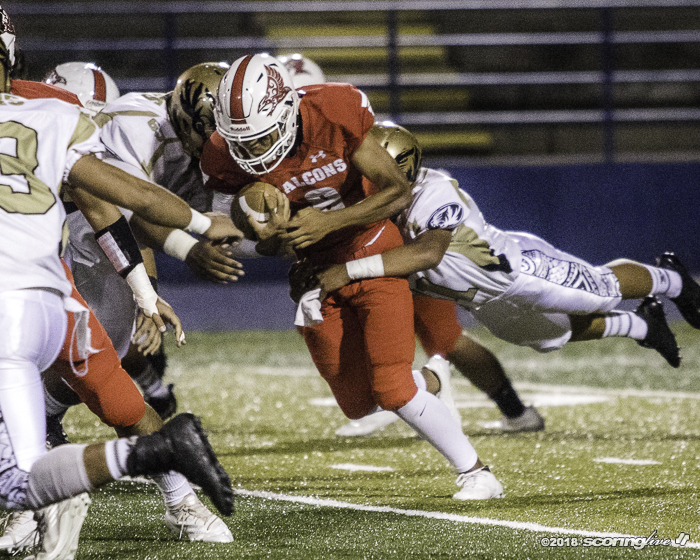 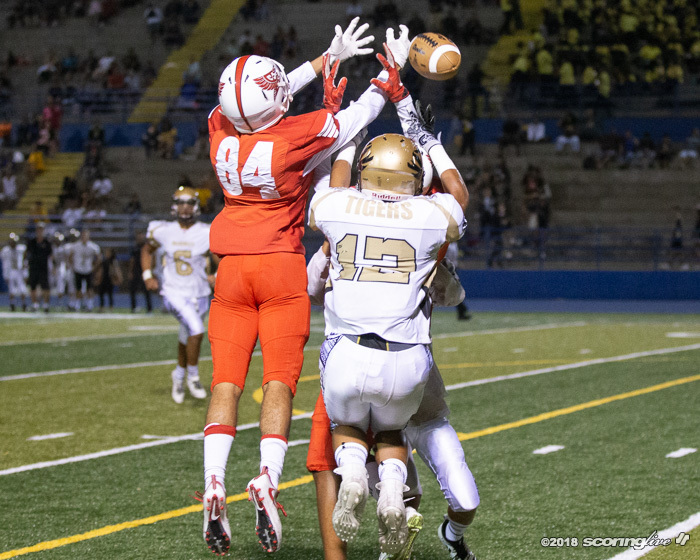 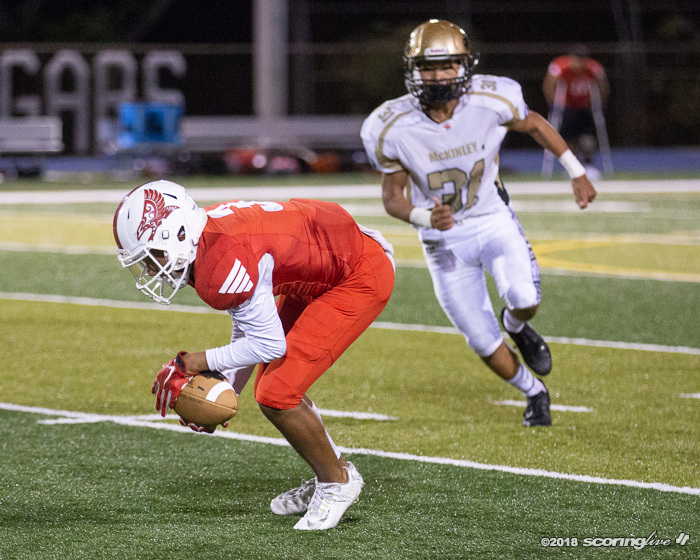 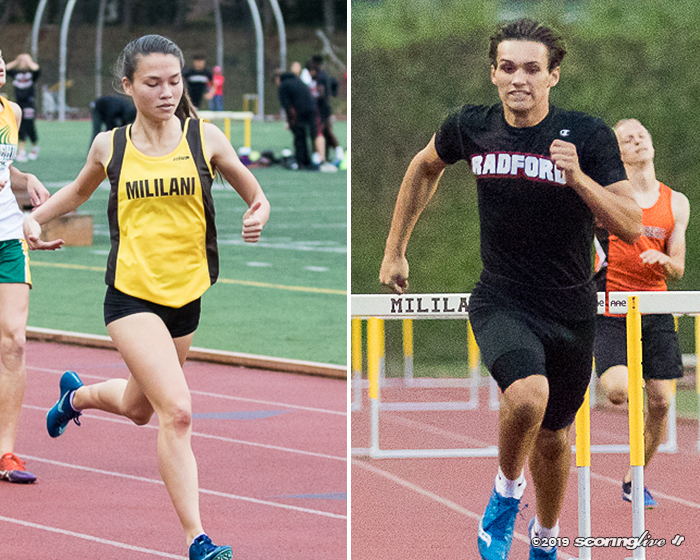 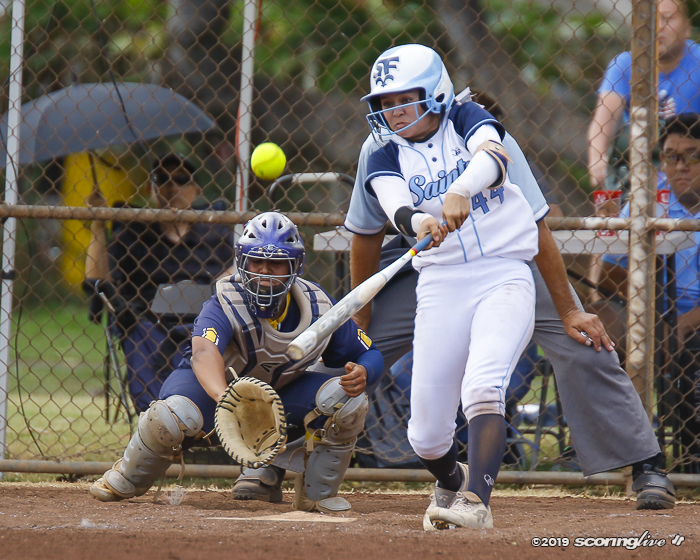 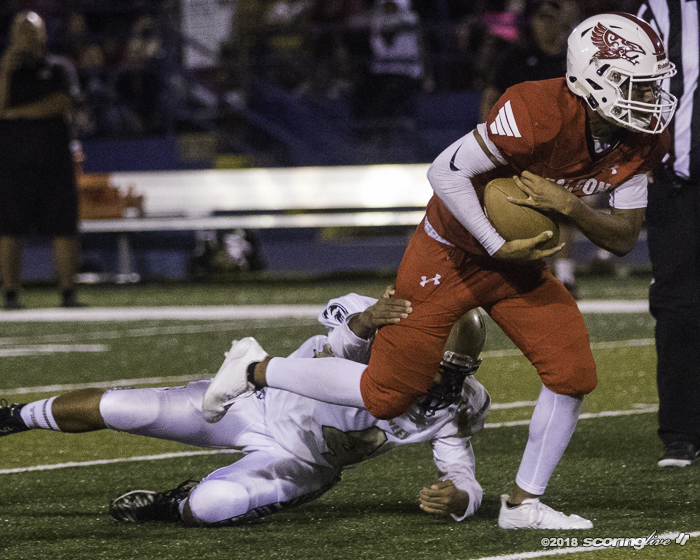 Kalani scored its final points of the game on its first drive of the second half. 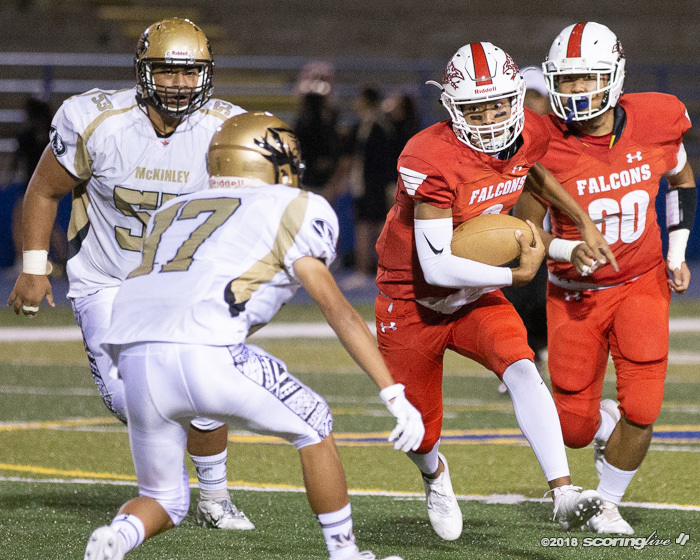 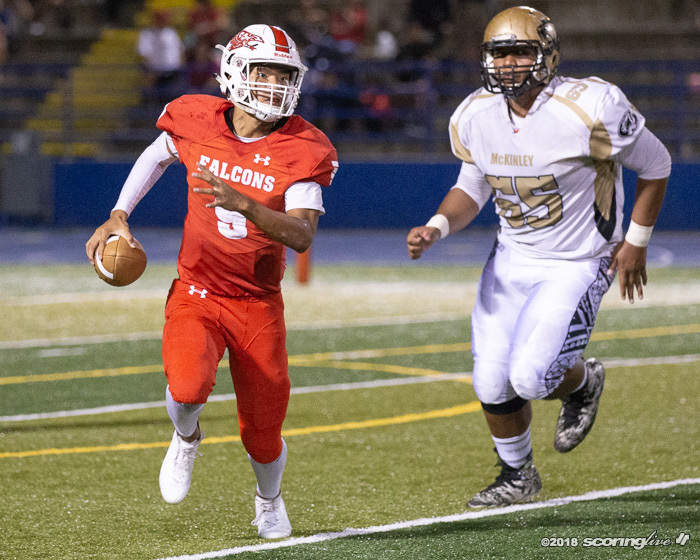 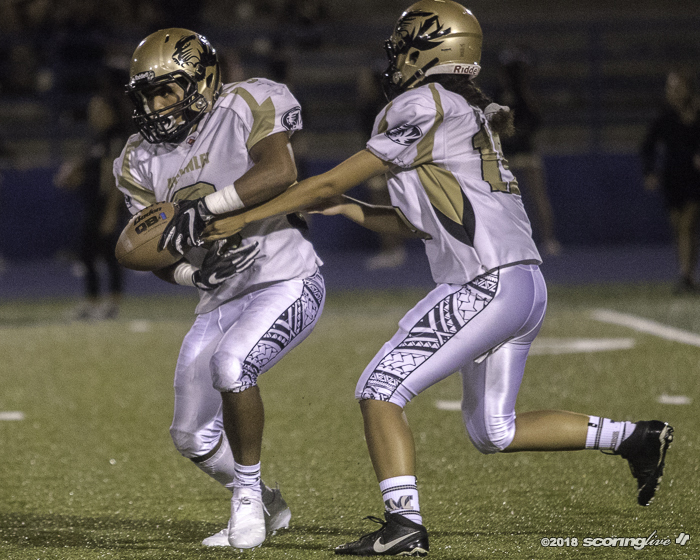 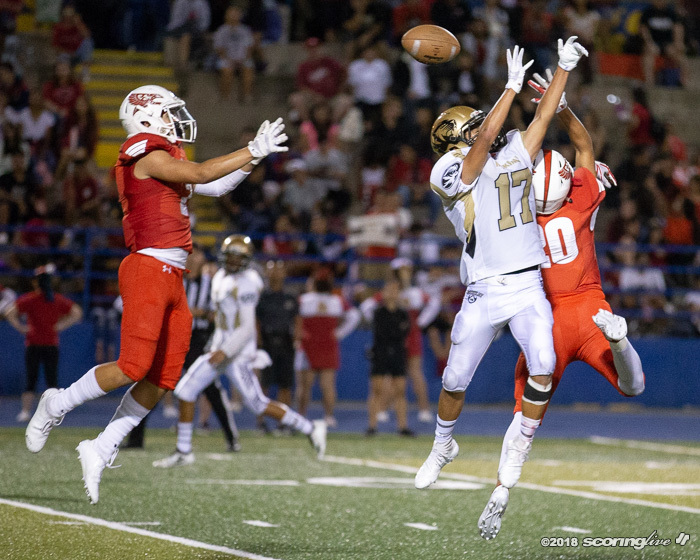 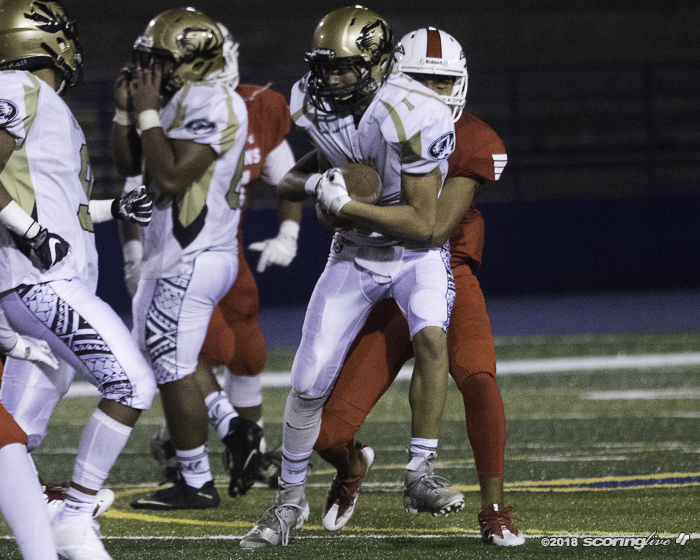 A Zion Puha punt pinned the Falcons at their own 1-yard line, but Kalani was able to drive the length of the field with a 15-play drive before Sakamoto threw a 31-yard scoring strike to Ah Sam with 2:44 to play in the third quarter. 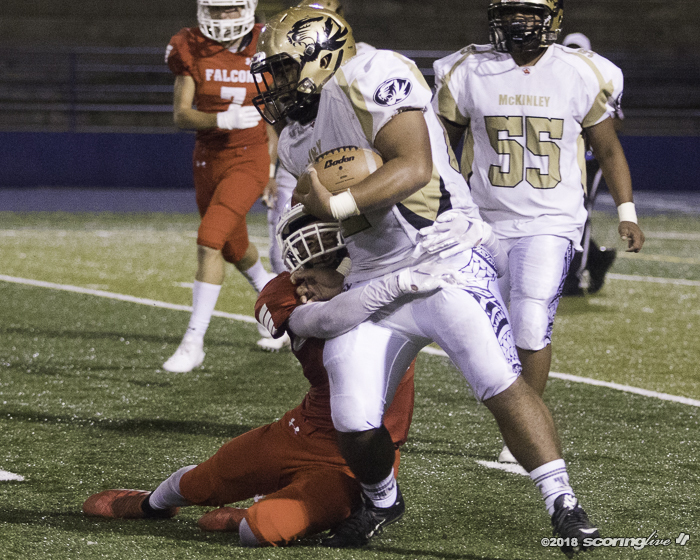 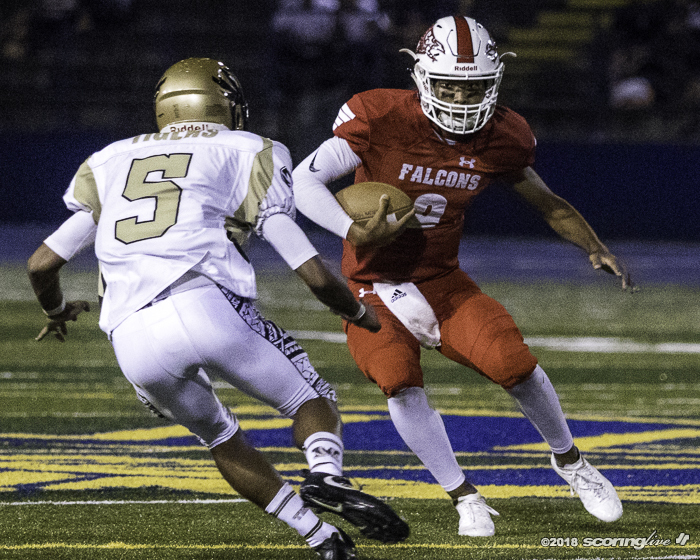 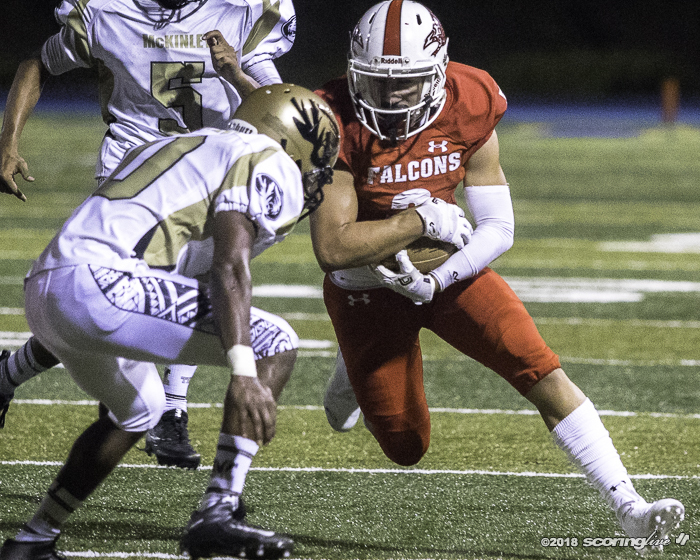 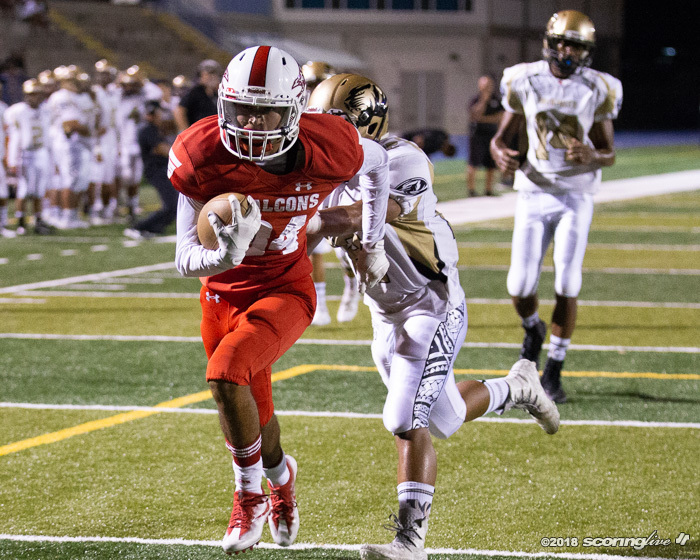 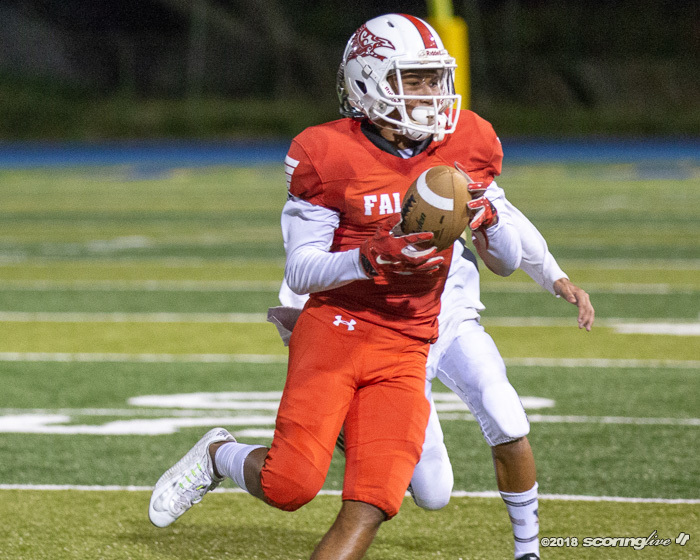 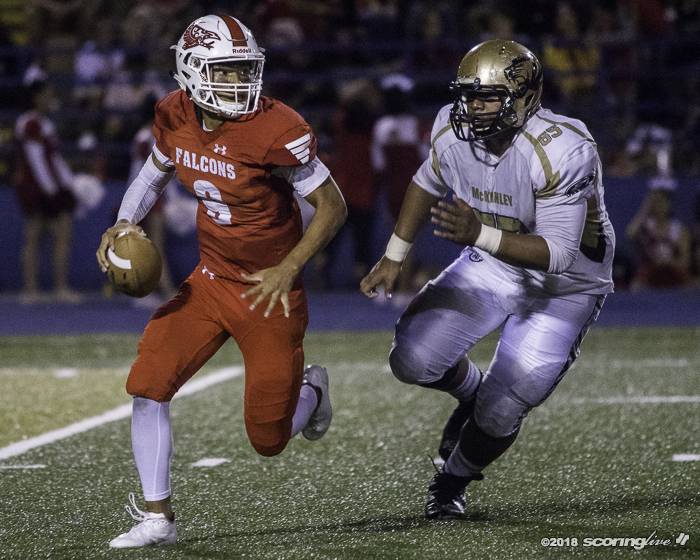 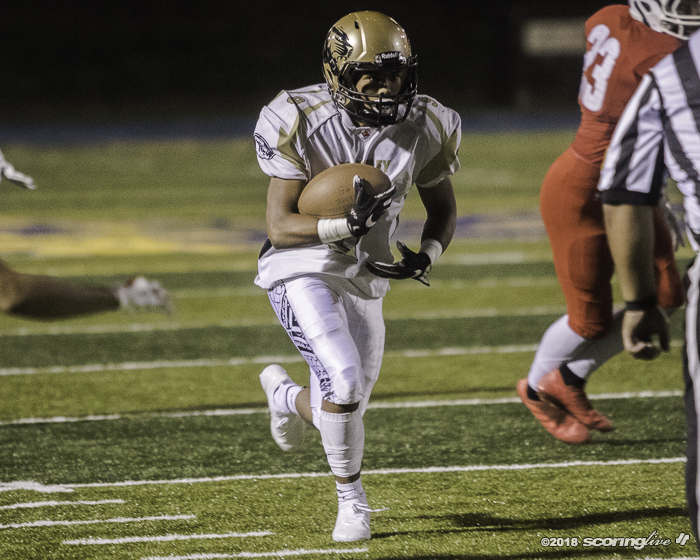 McKinley added a late score on Migguel Camacho's 80-yard catch-and-run, but went nowhere on its final drive of the game as the Falcons were able to hold on for the win.